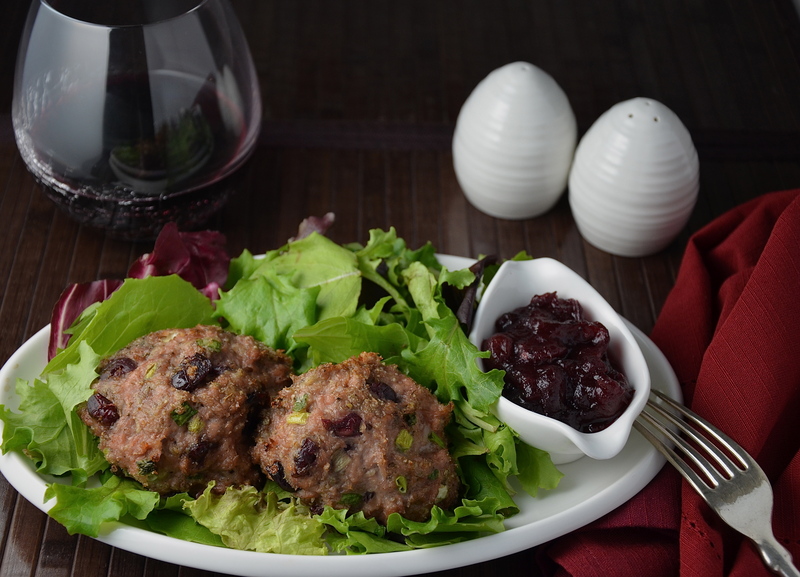 Most people associate turkey with the holidays, but in my family, we eat it year round in many forms: turkey meat-loaf, turkey meatballs, turkey chili, turkey soup and on and on…I made these turkey burgers the other day, inspired by the festive season that is quickly approaching. I live in the land of cranberries, so I added dried cranberries to the recipe, along with some poultry seasoning. I served them with some cranberry sauce (sometimes I make my own cranberry chutney) and was so pleased with the result that I thought I would add it to the blog. Many of you may be wondering where the bun is, but my husband and I always try to avoid a few extra carbs and generally eat these with some salad or steamed veggies. However, if you want a sensational burger, put these patties on a bun with some mayonnaise and cranberry sauce. Add a layer of your favourite stuffing. Top it with a thin slice of colourful baked yam and you will have Christmas dinner on a bun!! Yum…I’m making myself hungry! I sure hope you enjoy these! Place all ingredients into a medium bowl and blend until all ingredients are incorporated. Form into palm-sized patties and place on a parchment lined baking sheet. Place in oven and bake for 30 minutes, until the burgers are golden and cooked throughout. Serve with cranberry sauce or cranberry chutney, or on a bun as I described above. Bon appétit! Cranberries and turkey, the two ingredients I most associate with Christmas in one awesome burger. Looks beautiful! Hey Gypsy Moon! Thanks for the comment. Me too…I love cranberries and eat them with tons of things this time of year. Have a great week! Lucky are those living in the land of cranberries. I wish I was your neighbour. The turkey burgers sound delicious, served in a bun with some chutney…have you posted that chutney recipe? I would love to try it. Have a wonderful day!!! Hi Liz, yes, cranberry land is a delicious place to live! And no, I haven’t yet posted a recipe for the chutney. I will have to do that this month, the only problem is I have made quite a few!! I will have to pick out a good one and post it. Thanks so much for taking the time to comment! Have a great week!